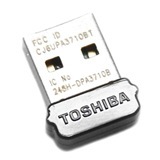 The Toshiba Bluetooth USB Nano Adapter adds Bluetooth connectivity to your PC enabling wireless communication with a wide variety of Bluetooth devices. The nano adapter is drastically smaller than other USB adapters and can be left in the USB port of your computer. CAN YOU TELL ME THE SPEED OF THIS DEVICE , STATED LIKE IN MSPC ?